I don't know how it got to be almost a week between posts. I know I am having a bit of trouble getting back in the "groove" but I honestly didn't realize it was that long ... I'll never get actually caught back up at this rate LOL. My favorite was my left thumb, it got the clearest design. I've had lots of helpful suggestions in the comments for the tutorial & I'll be giving it a 2nd go soon with some Chinese characters that I think will look really cool & not obviously backward even though of course they will be. Upcoming posts include: China Glaze Icicle with Bundle Monster stamping, China Glaze Reggae to Riches TOTD, a couple manis (a fail & the mani I actually wore) using Sally Hansen Lady Luck & Butter London The Black Knight, Icing Thunderstorm on Mom's nails, & maybe even the fruit tart vid if I have time to finish it =) Thanks for reading. Wow Thank you! That's some good info..Did you say "Murphy's seconds"? after rubbing alcohol. I love them! It almost has a vintage feel to it. I've seen many versions of the whole newspaper nail-look but I haven't seen this. Looks really cool! I really like this! 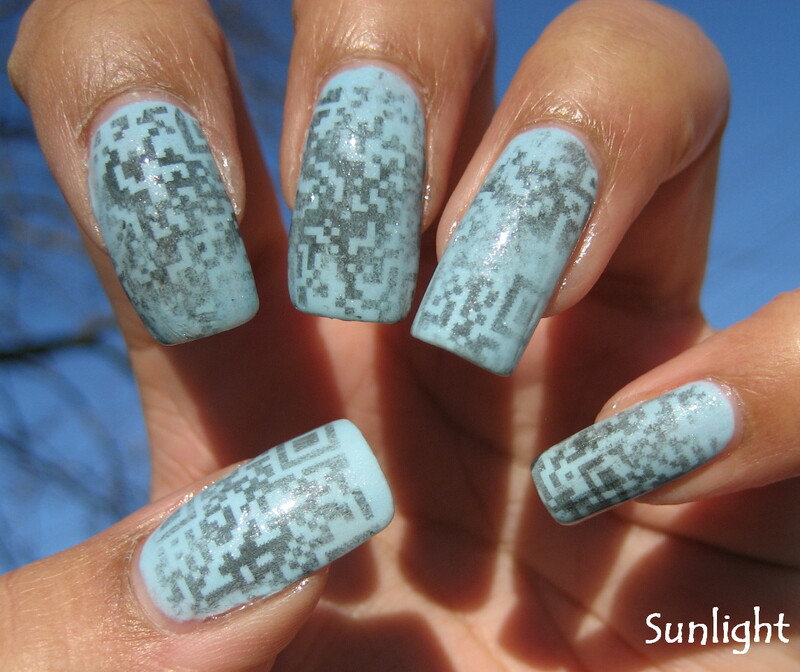 Both the baby blue polish and the interesting gray design. This looks really cool and I like that it's a different take :) I've only had a newspaper mani once (actually on my toes and my bf did them on me lol :)) but I choose two characters from a comic strip so it wouldn't matter that they were backwards. The first time I tried the newspaper nails I actually used a Chinese news paper. It looks really cool if you place the paper on an angle. I didn't like the Chinese characters straight up and down. Hi :) I love your blog and YT tutorials! You are doing some amazing things on your nails! 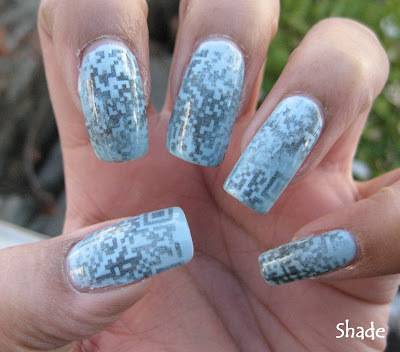 And idea of QR codes on nails is brilliant and unique! - puting cotton ball moist with alcohol (only) when newspaper is on your nail, for about 10 sec. I am waiting for your next posts.